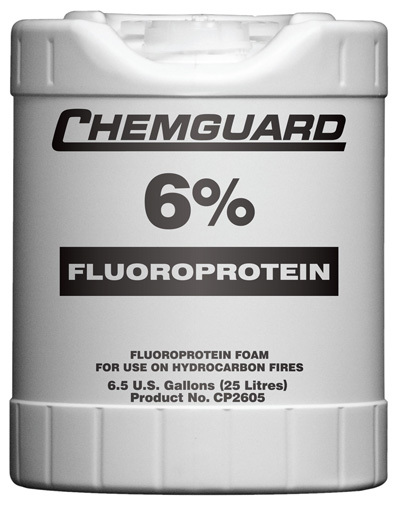 The CHEMGUARD brand 6% Fluoroprotein Foam Concentrate, CP2605, is formulated from hydrolyzed protein, fluorochemical surfactants, foam stabilizers (metal salts), bactericide, corrosion inhibitors, freezing point depressants and solvents. It is transported and stored as a concentrate to provide ease of use and considerable savings in weight and space. Two fire extinguishing mechanisms are in effect when using fluoroprotein foams. First, a foam blanket prevents the release of fuel vapor. Second, the water content of the foam provides a cooling effect. CP2605 Fluoroprotein Foam Concentrate is intended for use on Class B hydrocarbon fuels having low water solubility, such as various crude oils, gasoline, diesel fuels, aviation fuels, etc. It is not suitable for use on fuels having appreciable water solubility (polar solvents), i.e., methyl and ethyl alcohol, acetone and methyl ethyl ketone. This concentrate can be used only with air aspirating type discharge devices. 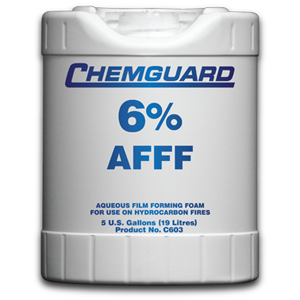 It can also be used with foam compatible dry chemical extinguishing agents without regard to the order of application, to provide even greater fire protection capability. Performance CP2605 is measured against specifications and standards such as EN 1568:2008 part 3 and UL-162. When used with fresh or salt water or water of any hardness at the correct dilution and with most conventional foam making equipment, the expansion ratio will vary depending on the performance characteristics of the equipment. 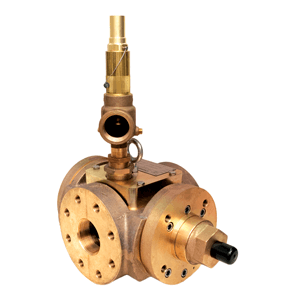 Air aspirating discharge devices produce expansion ratios from 6 to 1 to 12 to 1 depending primarily on type and flow rate. In general, the higher the flow rate the higher the expansion ratio. Therefore, monitors and foam chambers normally produce higher expansion ratios than foam water sprinkler heads and hand held type nozzles. Typical expansion ratios for foam chambers are in the range of 5 to 1 to 7 to 1, and for foam water sprinkler heads in the range of 3 to 1 to 6 to 1. Subsurface injection is a special case where generally speaking, expansion ratios of 2 to 1 to 3 to 1 are preferred but up to 4 to 1 is also effective. CP2605 Fluoroprotein foam has an operational temperature range of –10°C and +60°C. Limited exposure to temperatures above +60°C does not affect the firefighting performance. When stored in the packaging supplied (polyethylene drums or pails) within the temperature limits specified, or in equipment recommended by the manufacturer as part of the foam system, the shelf life of CP2605 Fluoroprotein foam concentrate is generally in excess of 10 years. If the product is frozen during storage or transportation, thawing will render the product completely usable. 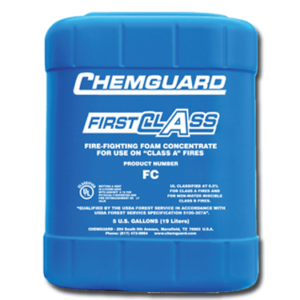 The factors affecting shelf life and stability for CHEMGUARD brand foam agents are discussed in detail in our Technical Bulletin for storage recommendation. Safety and Handling See our corresponding “Material Safety data sheet”. There are no specifications or standards which address the subject of compatibility of different manufacturer’s brands of fluoroprotein foam concentrates. In an emergency or if the manufacturer has supporting test data to substantiate that the mixture meets the same requirements as the individual component concentrates, they may be mixed together in the same storage vessel. Different types of foam concentrates, i.e., AFFF and fluoroprotein base should not be mixed under any circumstances. CP2605 – as with all TYCO Products – is subject to very stringent quality controls throughout all stages of production, from incoming raw to the complete product and is manufactured in an ISO 9001:2008 controlled facility. Quality assurance is therefore guaranteed.